What is blue-green, packed full of nutrients, and native to some of the most beautiful places on Earth? Spriulina. This algae is reported to be one of the most nutrient dense foods on earth. It's even being studied by NASA, to grow in space. But what other benefits does it have? Nutrition- A single tablespoon of Spirulina contains 4 grams of protein, 15% of the recommended daily amount (RDA) of Riboflavin, 11% RDA of Thiamin, 4% RDA of Niacin, 21% RDS of Copper, and 11% RDA of Iron. It also contains a good amount of magnesium, potassium, manganese, healthy fats (omega-3s and omega-6s), and just about every other nutrient necessary for us. Detox- Spirulina is super effective at detoxing heavy metals from the body, especially arsenic. It also helps reduce the symptoms of radiation sickness. Candida- Candida is present in every part of the human body. It's necessary for a healthy balance of our microbiome. However, when it gets out of control, it causes major problems such as yeast infections. It's even been linked to several autoimmune disorders. Spirulina, however, helps keep Candida under control. Sinuses- Allergic rhinitis, triggered by environmental allergens (pollen, animal dander, etc), is the inflammation of the nasal airways causing an excess of mucus production which can lead to stagnation and infection. Spirulina has been shown to reduce that inflammation, preventing the production of excessive mucus. Natural Energy Boost- Not only does Spirulina help improve our nutritional intake, it also helps to provide a natural energy boost. It also helps improve muscle endurance, making this a great supplement for athletes. Cardiovascular Health- Spirulina is great for your cardiovascular system. It lowers triglycerides and LDL (bad cholesterol) while raising HDL (good cholesterol). It also protects LDL and keeps it from becoming oxidized, preventing a number of cardiovascular diseases. 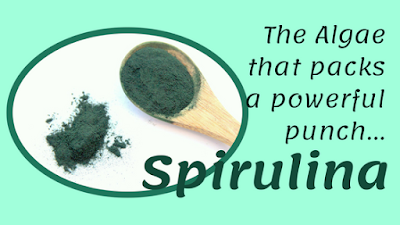 Spirulina also reduces blood pressure and helps to prevent the onset of anemia. Cautions- Some people may have an allergic reaction to Spirulina. People with phenylketonuria (PKU) should avoid Spirulina. Spirulina should also be avoided by people with autoimmune conditions, as it could trigger a flare-up. It can also cause harmful interactions with certain medications used to treat inflammatory disorders. I only included a basic introduction to this curious little plant. I hope you have learned a new appreciation for Spirulina. If you have any questions or comments, please leave them below.